To experience Virtual Plasencia V 1.6 you will need to download the Apple MacOS or Microsoft Windows OS standalone application. Go to the download page..
Yours is a quest to find ten objects/artifacts that reveal several short stories about the interrelations and lives of Placentino Jews, Christians, and Muslims. To learn more about these ten objects/artifacts (for example, a set of hand shackles or a broadsword), read more on the historical narratives page. Although mostly intuitive, roaming through our 3D world requires a bit of preparation. To experience Virtual Plasencia V 1.6 you will need to download the Apple MacOS or Microsoft Windows OS standalone application. Go to the download page. Upon the launching/opening of Virtual Plasencia, the navigation instructions window will appear. Be sure to take a few notes regarding the user controls for Virtual Plasencia. Launch menu displayed on opening Virtual Plasencia. Arrow keys – Use the arrows to walk (front, back, left, right). Mouse or Trackpad – Use your mouse to look around (or control camera view). Esc – Press ‘esc’ to open the main menu and pause the game/simulation (“Virtual Plasencia”). M – Press ‘M’ to open and close the city navigation map. T – Press ‘T’ to open the timeline menu and “travel through time”. You will need to use time travel to transport yourself to other “years” so that you can locate new objects/artifacts that reveal our historical narratives. Space bar – Press the spacebar to toggle the camera controls on-and-off. This will make it easier to click on menus in the game/simulation. H – Press “H” to display the Help Menu (which presents navigation controls) at any time. To continue and hide this main menu, click on the green “Play!” arrow. Virtual Plasencia is now open! 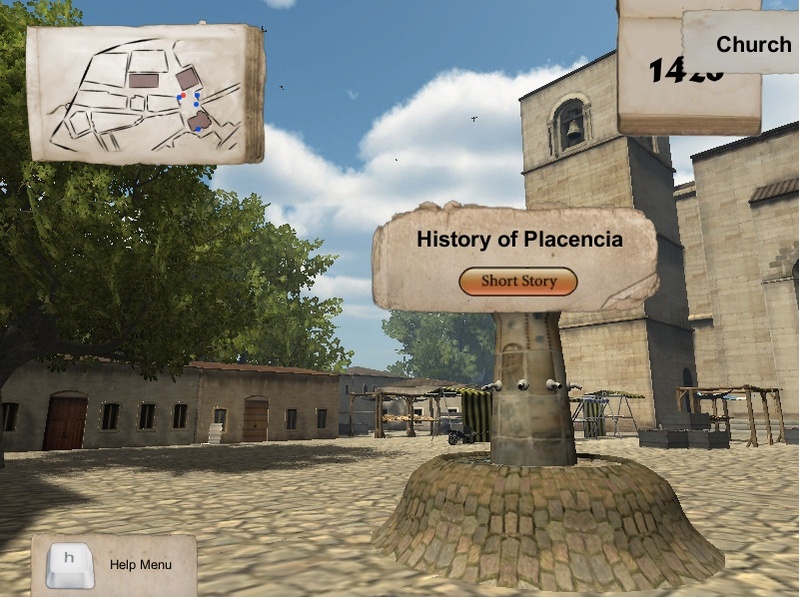 You are first presented with the opening historical narrative about 15th century Plasencia. Click on “Next Page” to turn the pages of the book. Click on the “X” to close this book. Viewing is controlled with the Mouse or Trackpad. Clicking on the Space Bar will disable your mouse or trackpad temporarily and disable the movement of your camera view. Clicking on the Space Bar again will re-enable your mouse or trackpad. You may wish to turn on-and-off your camera movement at times to simplify your navigation of the world. Walking is controlled with Arrow Keys. Arrow Keys always control your walking (front, back, left, right) inside of the world. Initial view of the Plaza de San Nicolas. With Virtual Plasencia now open, please notice several items. Navigation Map. In the upper left-hand corner of the screen you will see the navigation map. The position of the “red dot” indicates your location in Virtual Plasencia. “Blue dots” indicate the location of objects/artifacts that tell individual stories about the community. Blue dots will appear and disappear when you use the time travel feature (“T” button). We will give you more information about time travel in a minute. Current Year. In the upper right-hand corner of the screen you will find the current year in Virtual Plasencia. As you remember, you can travel through time using the “T” button and experience different communal events. History of Plasencia. To read the introductory short story for Virtual Plasencia, click on the yellow “Short Story” button. Click the “close” or “X” button to return to the environment. Don’t forget about Your Help Menu. Just hit the “H” button to bring up the following instructions that will appear at the bottom of the screen. “H” button will toggle on-and-off the Help Menu. The Main Menu allows you to change graphics and sound options. When making changes using the Main Menu, be sure to toggle off your Help Menu so that you can see all Main Menu buttons. Use the “H” button to toggle the Help menu on-and-off. 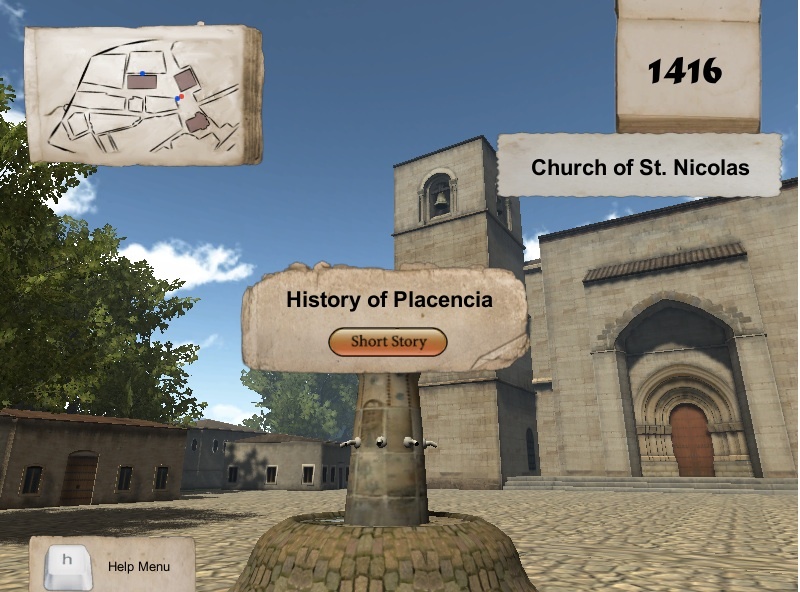 To “Travel through Time” and to search for “objects” with stories within Virtual Plasencia, either (a) click on the year or (b) press the “T” button. After doing so, the following timeline will appear. Travel Through Time. Either click on the DATE with your mouse or use the “T” Button. Using your mouse or trackpad, you can advance on the timeline to later years. Click on a later year and the “red dot” will advance to that year. Click “Travel Through Time” to advance to that future year. 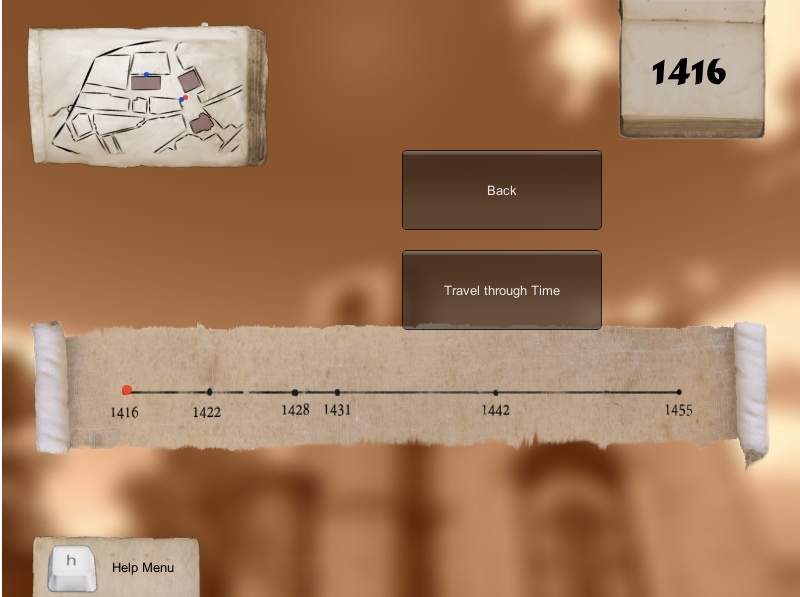 For example, if you advance the year to “1428” by using your mouse and then click on “Travel through Time”, you will be transported to a different era in Virtual Plasencia. Below, we have advanced to “1428” and now a new book welcomes you to the year. 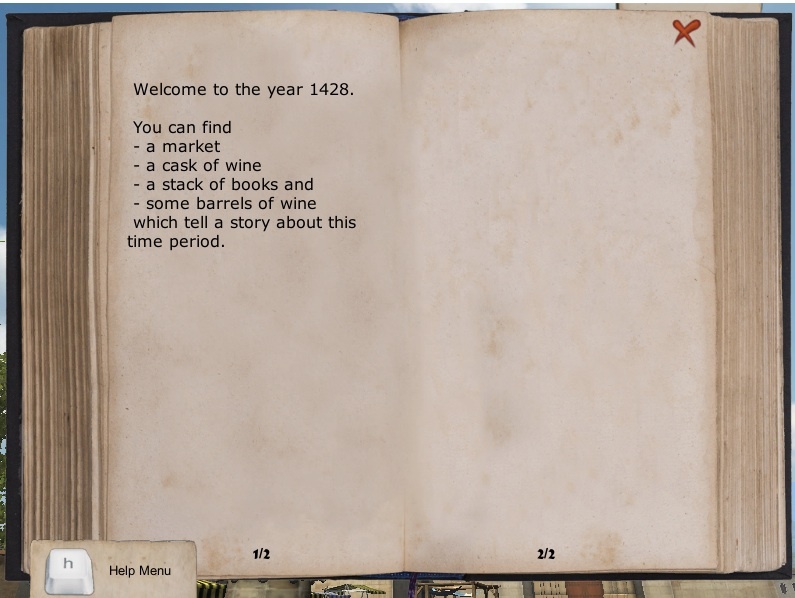 Here, you are instructed to look for particular objects that are only visible in 1428. For example, a “market” with a short story attached to it, a “cask of wine” with a short story attached to it, and a “stack of books” with a story attached to it. Opening Page After Travel Through Time to 1428. After closing the book, you will now find yourself in the Plaza de San Nicolas. 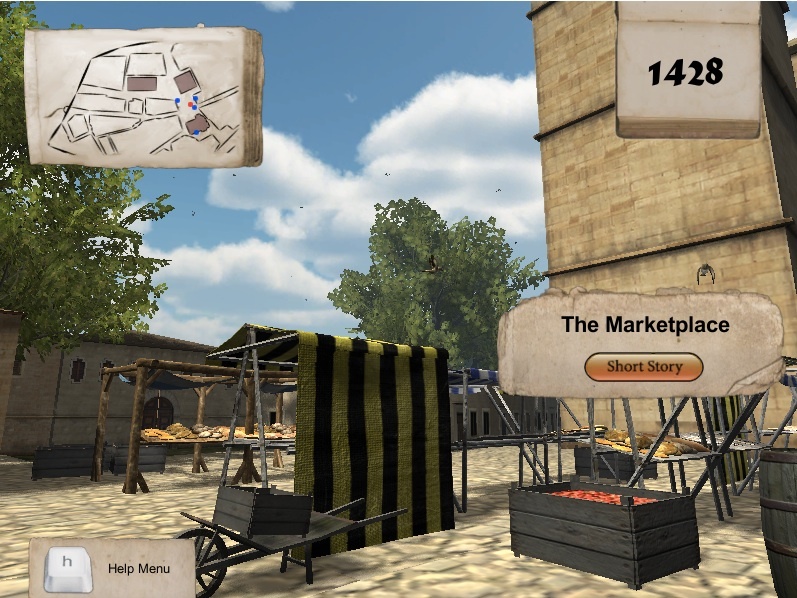 In the year 1428, a market now appears in front of the church. By walking over to the market and clicking on the “short story” button, you will reveal an important historical narrative. 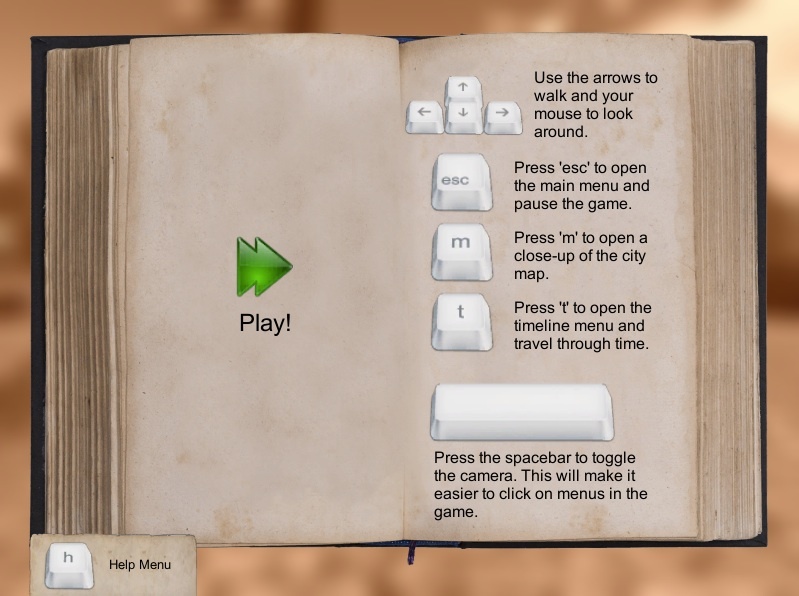 Remember you will need to use your Arrow Keys to walk over to the market and reveal the short story. At the Plaza de San Nicolas in 1428. After walking over to the marketplace (which only appears in the year 1428), you can click on the “Short Story” button to read about it. At the end of each short story, you can find a hyperlink to the www.globalmiddleages.org website (our University of Texas at Austin partner). Currently, these links are not active. UT-Austin will be hosting a permanent copy of Virtual Plasencia, as well as longer versions of these short stories. Each custom UT-Austin link leads to a more detailed narrative with references. Longer narratives are also found on our Ten Historical Narratives Page. At the marketplace in 1428. Click on the “Short Story” button to reveal a historical narrative. 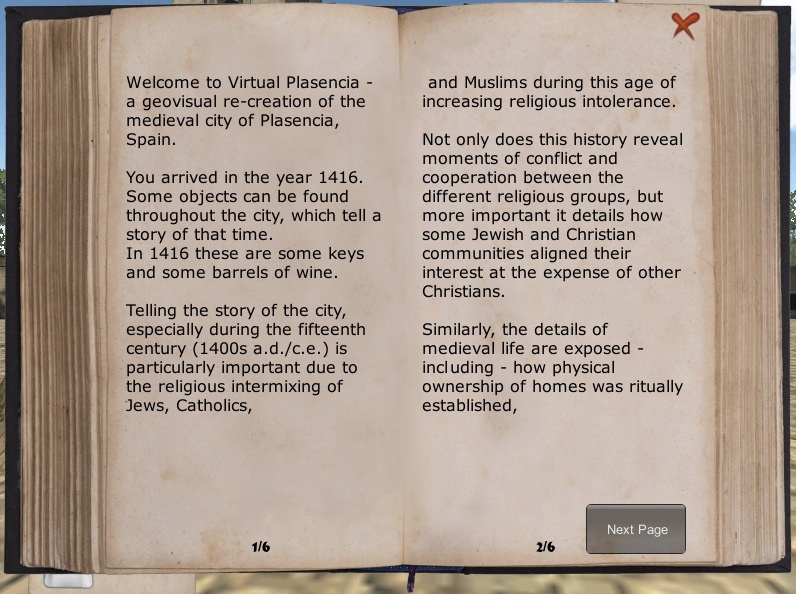 This concludes the instructions on how to navigate Virtual Plasencia. Time to go to Virtual Plasencia V 1.6! Click to Go!